The first mention of a mandore is in Virdung's “Musica Getutscht” in 1511. 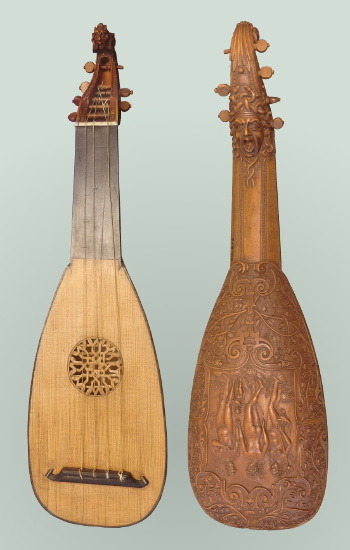 Its popularity grew quickly, and it became a common instrument from the mid 16th century to the late 17th. It has largely been forgotten, but there is an attractive surviving repertoire, from England, Scotland, France, and Germany. The mandore existed in various sizes and shapes, but all of them resembled a miniature lute. 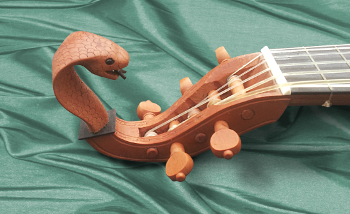 Some larger versions were constructed like a lute, but many were tiny, and carved from the solid. 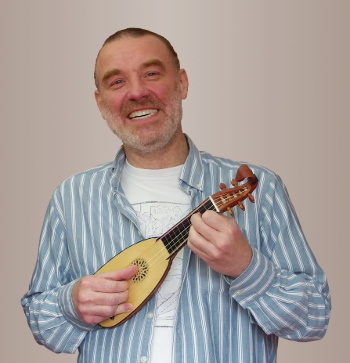 Typical early mandores had four courses, often double-strung (two strings per course, like a lute or renaissance guitar), but sometimes single-strung, which was unusual for plucked instruments of the period. Later instruments tended to have five single-strung courses. There were several characteristic tunings, all based on fifths and fourths - again, an unusual tuning scheme for the period. Ian with his mandore. Yes, it really is that small. One of the finest survivng mandores is in the Victoria and Albert Museum, London. In 2015, Ian Pittaway and I went down to the V&A to take measurements and photographs. Ian wanted to commission an instrument closely based on it. Having studied the instrument at length, and discussed it with curators at the V&A, we concluded that the attribution of "Boissart 1640" (supposedly written on the body, but now invisible) should read "repaired and modified by Boissart, 1640". 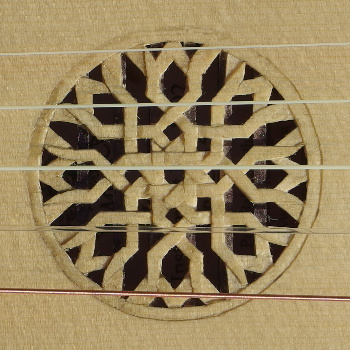 We believe that it started life in around 1570 as a 4-course mandore, double-strung apart from a single top string. Boissart converted it to a 5-course, single-strung instrument. We decided that I would reproduce the instrument with the 17th century modifications, to allow 5-course repertoire to be played. I reduced the original 7 pegs to 5 (two of them being redundant after Boissart's conversion), and made a slight adjustment to the body shape to allow 9 tied-on frets. We experimented extensively with stringing, eventually finding a set that responds well across the range at modern pitch (a' = 440Hz). The basic tuning is g c' g' c'' g'' . It will accept being retuned to g c' g' c'' e'' and f c' f' c'' f'' without having to change strings. That covers most of the tunings in the surviving sources. The V&A instrument is one of the smaller types of mandore. 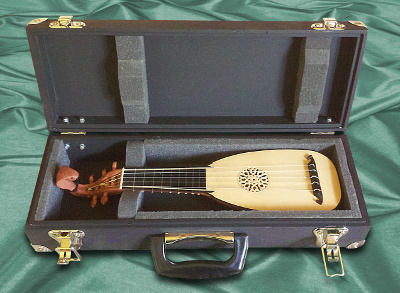 It has a string length of only 281mm - less than half that of a typical lute. The photograph of Ian playing my reproduction shows just how small it is. It's not unplayable, though. Ian had surprisingly little trouble making minor adjustments to his playing technique to make it sing nicely. Despite its size and pitch, the mandore gives little impression of being deficient in the bass register. The projection in the mid range is remarkable, and the top is delightfully brilliant and "tinkly". Part 1 covers the history of the mandore. Part 2 covers the V&A mandore, and explains our conclusions. Part 3 is a record of the construction of the first Diabolus mandore. This article by James Tyler gives more background on the mandore and its repertoire. The Wikipedia entry for the mandore is also worth a look . Single strung four course? Six course? Different carvings? Cheaper version without the carving? I'm open to suggestions.